Call 304-754-3282 to schedule a visit. 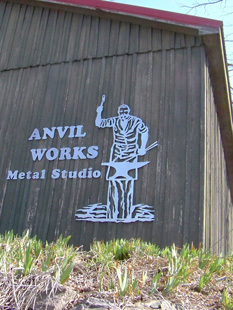 Anvil Works' studio is a versatile workshop for art metal projects. It was designed and built by Lee Badger in 1998 to be a creative space for his work as a metal designer and artist-blacksmith. Specialized saws and trip hammers surround a variety of forges, anvils, swage blocks and vices in the hot work area. Contemporary cutting and welding tools share space with traditional blacksmithing equipment. Compressed air and electrical power tools join forces with hand tools, racks and workbenches. The work space is designed to be flexible and accommodating, depending on the project underway. The focus is on hot-worked metal, primarily iron and steel, but non-ferrous metals and sheet metals are often included in the variety of work. Many different types of artistic shaping, bending, twisting, forming, joining and hammering can be accomplished here. At Anvil Works, the emphasis is on creative and unique projects combining a variety of modern and traditional metal crafts. The shop schedule is primarily devoted to sculpture, furniture making, and the creation of interior and architectural art metal on commission. Occasionally, studio projects involve restoration of historic metal work or projects that require a wide variety of metal working techniques. Some of these special commissions and projects can be very large and complex, like the construction of clock towers and the repair of historic mechanical devices.